Our mission is to help every livestock farmer make sure their animals remain healthy, wherever they may be in the world. To fulfil this mission, we develop veterinary solutions with our customers’ changing demand in mind. Kepro supplies veterinary pharmaceuticals for preventing and solving health problems with animals. We offer added value to our clients thanks to constant development of products and services and the application of our knowledge and skills. In an ideal situation, Kepro’s veterinary solutions are applied as part of well thought out and consistently conducted farm management schemes. This means they can play a supportive role for healthy and optimally performing livestock. Kepro has the knowledge in house and finds it important to share this with you. You will find all sorts of information about animal diseases, good farm management and the use of Kepro products in the Kepro Academy. Be aware of fake Kepro products! Keprogan is a blend of fatty acids and etheric oregano oils. Fatty acids are well absorbed and easy to digest. They optimize the growth of the intestinal villi, for better absorption of nutrients. Oregano oil is a source of carvacrol and thymol. Carvacrol and thymol are known to be powerful antibacterial and anticoccidial. They can also act as an antioxidant and increase the appetite. Oregano oil stimulates growth and renewal of epithelial cells in the gut, and therefore the animal can digest the feed better and quicker. 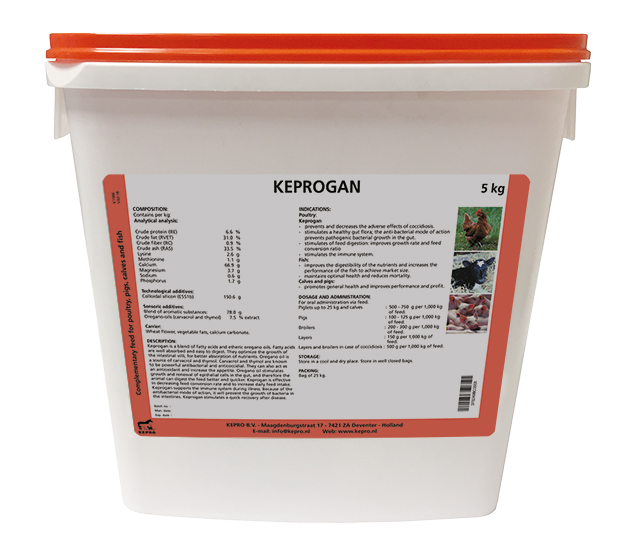 Keprogan is effective in decreasing feed conversion rate and to increase daily feed intake. Keprogan supports the immune system during illness. Because of the antibacterial mode of action, it will prevent the growth of bacteria in the intestines. Keprogan stimulates a quick recovery after disease.